HomeBlogSaving $$$ with "Pixie Dust"
Meet Darin Douglas, Supt of the Mt. 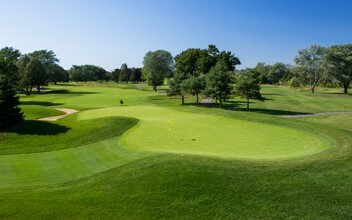 Prospect Golf Club in Mt Prospect, IL. The golf course was originally built in the 1920s, so it had all original greens and soil. The soil in the fairways was pretty much the soil that was there. So, they just stockpiled all the topsoil and spread it back out. There were areas where the soil was good and not so good. Darin first heard about Soil Tech products from his predecessor Fred Behnke, CGCS. While Darin was assistant supt., he remembers Fred calling the TurfTech Bio product “pixie dust.” “Fred would always say: go spray that pixie dust. He believed in the product and I just kept on the program ever since and really saw good results from it” said Darin. Right after the renovation Darin noticed there was standing water on some fairways and he noted that he hadn’t used TurfTech Bio that year. The following season he started applying the product again. “Using TurfTech Bio through the grow-in really helped the germination and the process move forward nicely. The rest of the grass caught up—like the slower germinating maturing turf caught up with the rest after I got back on the program. All those wet spots pretty much disappeared,” says Darin.